As I was looking ahead to starting a new job as Headteacher, I was thinking about all the conversations we were going to have about learning. To a large degree I wanted my teachers to be as up-to-date as possible within their own subject domains. They should know the latest OfSTED position ( eg with Moving English Forward or Mathematics: made to measure ) and be up to speed with exam specifications and assessment requirements. Subject knowledge and subject-specific pedagogical knowledge were going to be key drivers of everything we would do. However, in order to fuel the collaborative effort of reaching the ambitious goals we had for the school, we needed to establish a shared conceptual language for talking about teaching across the school as well as within departments. This post is based on my ideas at the time in 2014…..
Inevitably, different teachers will have engaged to different degrees with certain ideas depending on the books they’ve read, conferences they’ve been to and blogs they’ve browsed through and the content of their PGCE or other ITE programme. It strikes me that it would be a huge benefit to us all if we’re more or less on the same page when we’re discussing contemporary ideas about pedagogy, learning, assessment, motivation, neuroscience and so on. I don’t want people quoting half-remembered snippets from a Dylan Wiliam thing they attended years ago or citing Hattie effect sizes as absolute measures or talking about Growth Mindset, never having engaged with what Carol Dweck has actually written. 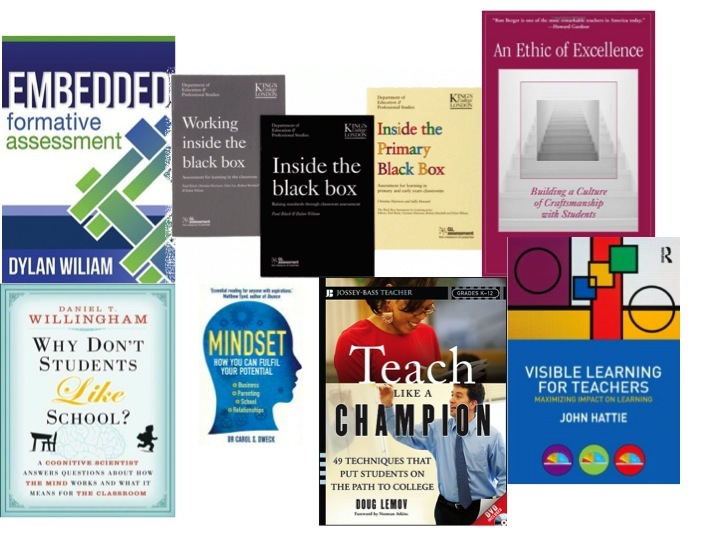 One of my first actions will be to buy a ton of books to stock the staff CPD library. I want to make it easy for everyone to read the books that will inform our discussions. Already, we’ve bought in copies of Dylan Wiliam’s Embedded Formative Assessment, Hattie’s Visible Learning for Teachers and Martin Robinson’s Trivium 21st C. But there is so much more for us all to absorb and share. Over the last two years, I’ve found that I can engage much better with the ideas in some of these books when I’ve seen the authors express their ideas directly – either in person at a conference or through some of the video material on the internet. In this post I’ve gathered some of the videos that I’ll be recommending that all of my staff engage with at an early stage. Each one links to a key academic or thinker and their ideas. Of course, there is also the growing world of teacher bloggers and teacher authors to engage with too and I’ll be promoting general engagement with all of that material – especially the people on my blog roll. John Hattie’s work provides an important insight into the nature of educational research and the notion of measuring impact. The idea that some strategies can be shown to have had more impact on average over time relative to others is crucial and his general message about the implications for teachers and the profession is very strong. This video, (with a counterpart Part 1) gives a very good idea of Hattie’s thinking. Of course, the effect size concept is problematic and is open to misinterpretation. We’ll need to have that discussion – but people will need to know the principles first. Dylan Wiliam is someone most people know of even if they haven’t engaged directly with him or his work. His website http://www.dylanwiliam.org/Dylan_Wiliams_website/Welcome.html is packed with materials to browse through. He has been leading the way for the last two decades in getting teachers to think about what they’re doing and why. Inside the Black Box was a revelation when we first encountered it back in the 90s. However, following the national adoption of AfL 10 years ago, lots of the ideas have become rather distorted, spawning various superficial AfL gimmicks or misconceptions about the meaning of ‘formative’ – but I firmly believe that every teacher should know very clearly what Dylan is saying. This video is a recording of a webinar so you won’t see him speak but it’s fascinating, including lots of references to research. Worth watching all the way through. Alongside his recent book, I think that videos like this could help us to establish a good shared understanding of what we mean by formative assessment and feedback and what these things can look like in practice. 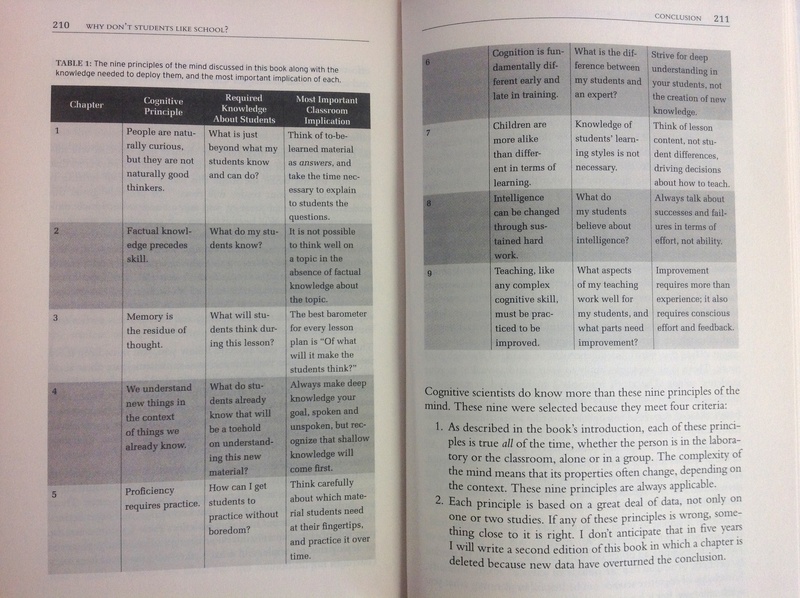 The field of cognitive science is giving us ever greater insights into how learning works. There are lots of people in this field but Daniel T Willingham does a very good job of making the ideas accessible and relevant to our school experience. This book, Why don’t students like school, is a must-read. He provides a handy summary in the concluding chapter which gives a feel for the key ideas and their implications for our practice. In particular it gives a firm steer in terms of the discourse around thinking, memory, teaching factual knowledge and the need for conscious effort and feedback to secure improvement. A great summary of Daniel Willingham’s book provided in the concluding chapter. On YouTube there is a whole series of fascinating short videos where Robert Bjork explains some key findings from his research into memory. From these you can get an idea of his findings and the general idea of ‘desirable difficulties’ necessary to secure long-term memory, possibly at the expense of the sense of short-term progress. This clip is a good introduction but I’d recommend watching them all. If we can all talk about storage, retrieval, interleaving and so on, we’ll be in a better place. Ron’s book is an inspiration to many people who read it. The attitudes that is promotes are so powerful, providing significant food for thought as we look at shaping our ethos. A specific example is shown through this classic Austin’s Butterfly video about the power of critique. It’s the spirit of it that is most crucial – that we shouldn’t accept mediocrity from any student; we should have aspirational goals for everyone and use specific techniques to enable students to reach them. I’ll be referring to Austin’s Butterfly a lot – as I have done in a couple of blog posts here and here. This video tells the story of some research that shows the power of teacher expectations. It links in with Hattie’s research – as this is one of the highest effects he cites. Higher teacher expectations lead to better outcomes. Obvious? Well – it’s worth watching this to see how teachers can change their interactions with students leading to better outcomes when their expectations are raised deliberately. Climate: They are simply ‘nicer’ to the students. Response opportunity: They give students more time to answer and more opportunities to ask or answer questions. Feedback: They clarify their expectations more thoroughly and expect better answers. I’d like my staff to know about Doug Lemov and his two books: Teach Like A Champion and Practice Perfect. Of course the American context is different but there is huge merit in engaging in several of Doug’s ideas. Strategies like 100% or Right is Right show how very high expectations and rigour in discussion can be achieved. His ideas about teachers’ practice are also very interesting – we won’t get better as fast as we could if just repeat our mistakes over and over again in lessons. We need to rehearse and practice specific strategies until we do them better. I have already sent my staff a suggested reading list and this wonderful book was at the top. I’ve written about the book in this review and I am very excited about working with my staff (and with Martin’s Trivium network) to explore how the ideas behind Grammar, Dialectic and Rhetoric can be brought to life in the classroom and beyond. 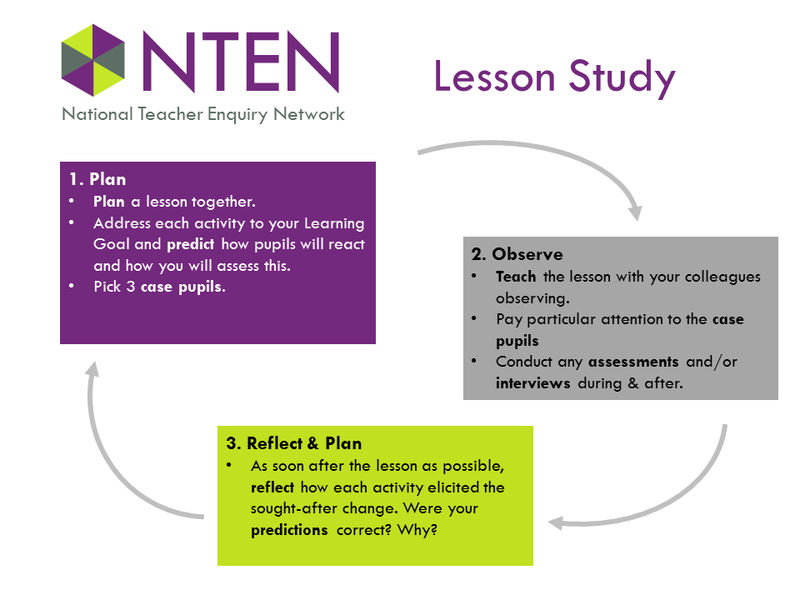 The NTEN Lesson Study Cycle. I’d like all of my staff to know in principle what Lesson Study is and how they could engage with it if they choose. I might use some of my own posts on this to get people started but, beyond that, there is a wealth of literature we can access via NTEN and other sources. The first step is to make sure everyone knows about it. There are lots of other ideas we’ll need to wrestle with together – ideas about Behaviour Management, technology and assessment for example. The goal should be that we’re always seeking to make sure the latest thinking is made available to everyone and that everyone does their best to engage with it. That way we’ll have the most fruitful discussions about taking the school forward. My view is that if lesson observations are to be about improving practice, then they should run along the lines of ‘Lesson Study’. I wonder if you run your official observations in this way? Also, the books that have influenced me the most recently have been by David Didau and Daisy Christodoulou. I pose a question to my class and in groups they find the answer on the Internet without my intervention. Come and see it in action. I am in North Yorkshire! Very inspirational and fantastic to have these ideas pooled in one article. If I had to choose a favourite – Pygmallion Effect : Robert Rosenthal. I know he’s not contemporary, but for me Vygotsky and his theory of the “proximal zone of development” continues to be a great guiding light in my teaching. The concept makes you ask yourself – what IS the “next zone of development” for this class / student…and also makes you ponder “how can I support their next development…”. Your post covers so much ground so succinctly, though – a fantastic guide to inspiring educators out there. Best wishes.